﻿﻿Thanks to the advent of the smartphone, poker players now have access to poker calculators at all times. 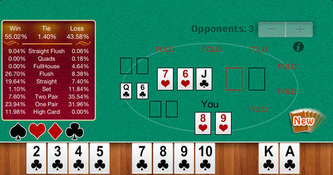 These calculators can be used to review your previous sessions in order to improve your game or used on the fly during to calculate the probabilities of a hand winning. ﻿The online poker industry is one that has grown dramatically over the last decade or so. One of the latest ventures for the industry is the adaptations to that of using your smartphone to not only play the game, but also to apply learning aids such as poker calculators. It’s these poker calculators that allow players to find out the mathematical probability of a certain scenario taking place. 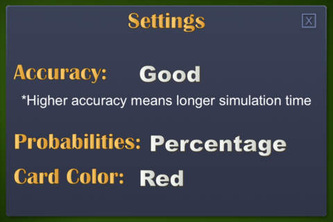 Essentially this then allows the player to make a decision based more upon what is likely to happen rather than simply guess work or even luck. 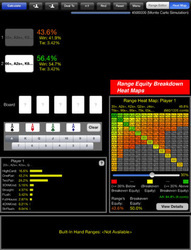 Poker calculator apps are becoming increasingly popular for many users as it provides a handy way to check previous plays but also to check probabilities whilst in-game. This article will be looking at some of the best iPad poker calculator apps on the market and seeing which are best for you to download. The Poker Cruncher app is a simple yet really well formed app allowing players to input a number of starting hands to see which will be favourite. You can add or remove as many players as you wish and also input starting hands for each. Once you have done this you can simply press the Calculate button in the top left corner of the app to tell you the probability of each hand winning. Additionally you can also input as many or as few cards you want onto the flop, turn or river before once again getting a series of results. 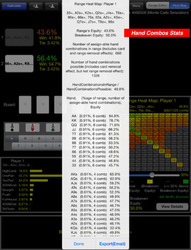 We love the addition of range button which allows you to assign a certain range of hands to your opponent. Each scenario can be saved and exported and there is additional information form the help and tutorial section integrated in the app. Whilst the design of the app isn’t the most appealing in the industry, the functionality of the Poker Cruncher app is second to none. 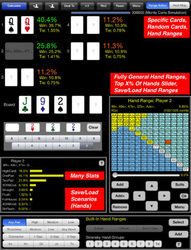 The Holdem Helper app is one that will allow you to learn the probabilities of which hands will beat your starting hand. The app is designed really well for the iPad and includes a tidy green background with the cards looking slick throughout. 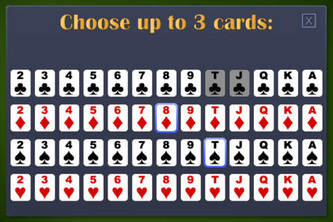 It starts by you choosing your hole cards and then you can either select the flop, turn and river or simply deal these which will give you a random outcome for each. 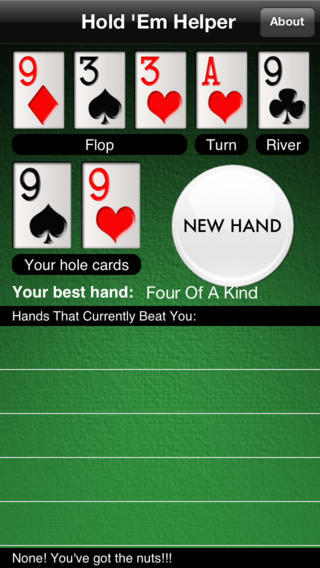 The app indicates what your best hand is and also makes you aware of which hands currently beat your hand. 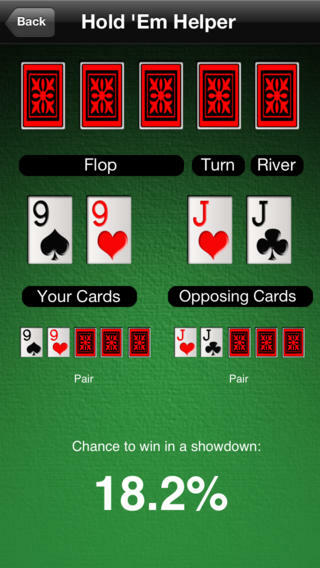 The best function for this app has to be the percentage of you winning the hand against any random two cards. This allows you to see your equity when holding hands like one pair on a drawing board and also a number of combination hands. It’s a great way to evaluate some of the hands you have played in your session and to find out if you got your money in at profitable times. 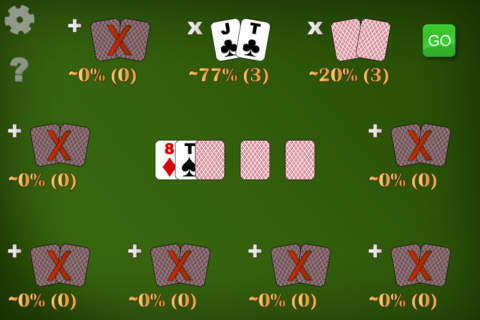 The Holdem Calculator is a very simple app and will be aimed much more at beginners trying to get their heads around the mathematics side of online poker. 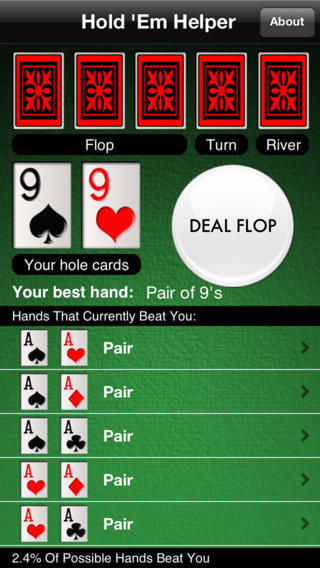 The app has a basic layout and it allows you to input your hole cards and the cards on the flop, turn and/or river. Once you have done this you can also select how many players are at the table and whether they are involved in the hand or have folded prior to your decision. 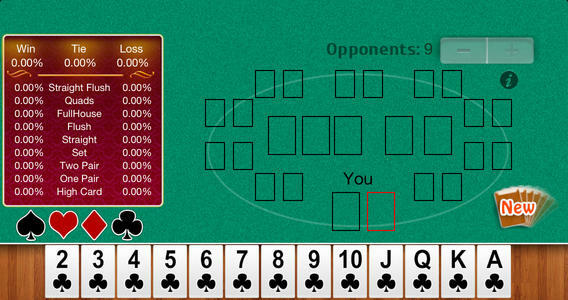 By clicking the calculate button you can see how your hand stacks up against any random hands that your opponent may have and the percentage of you winning that hand. Unfortunately this is about as in-depth as the app gets. There is no way to assign certain hands to players or even ranges of hands which adds a little bit to the guess work from the app. 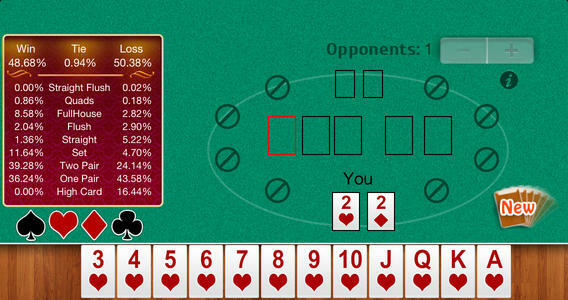 As we mentioned, the Holdem Calculator is very much aimed at the beginner poker player. 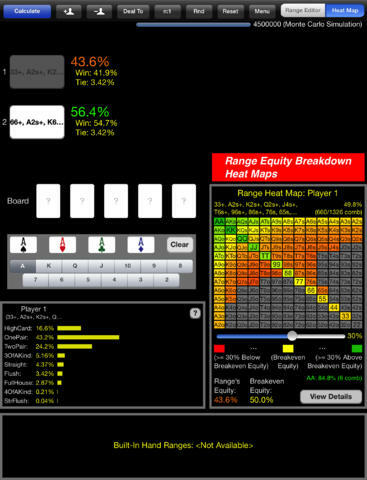 The Poker Sniffer iPad app is without doubt one of the best looking poker calculators on the market. The gun sheet metal finish makes it look super modern and the graphics for items such as the cards and the percentage readings also give it a modern feel. The app starts by giving you a quick guide into how to use the app, which is very handy indeed. You can select your starting hand and then if you wish a number of community cards. You can then edit the amount of opponents you are playing against and also input their starting hands into this. What’s really nice is that you don’t have to select hole cards for your opponents, so if you want to find out the percentages of winning against a random range of hands then you can do. But if you want to add in cards at certain times of calculating hands (and also remove players as they drop out of the hand) then the app will automatically calculate the percentages for the changes in scenario. The Free Holdem Calculator for iPad is one of the simplest poker calculators to use, but is also one of the comprehensive. It’s often tough to get the balance right between too much and too little when it comes to these sorts of calculators, but this app seems to have found a decent balance. The app starts with you in-putting your hole cards and then deciding on how many opponents are at the table. What’s good about this is that whilst you can choose an opponent to be sat, you can state if they have folded prior to the action you want to calculate which does have an effect on the outcome of the percentages. If you know the hole cards of your opponents then you can input these as well or simply leave them blank. 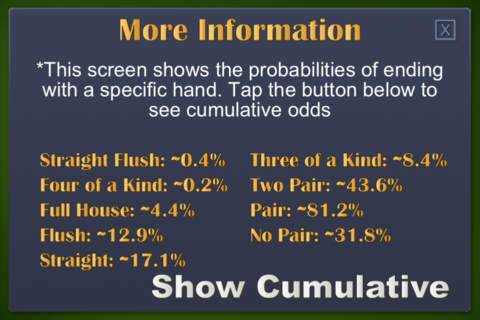 The card to the left of the screen indicates your percentages for winning the hand, losing, tying and also the probability of you hitting any of the hands in poker. This will automatically update and fluctuate depending on what decisions have been made for each street. This works especially well when finding out how different actions from your opponents effect the probability percentages of certain outcomes in the hand. 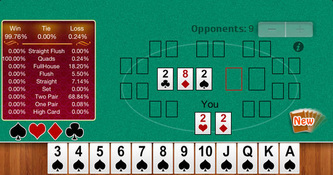 Card Player is one of the best known brands within the poker industry. 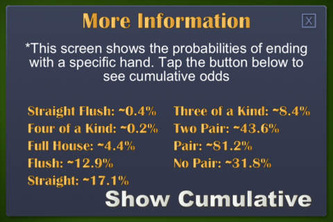 They are synonymous with providing everything there is to know about poker and one of their latest releases comes in the form of their mobile poker odds calculator. The calculator is actually very simple to use on an interface that won’t drain phone resources. You start by selecting how many players are in the hand you want to review before then choosing the whole cards for each player (if known). 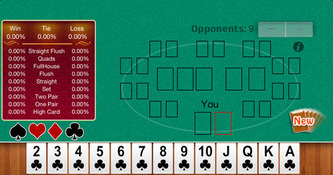 Once you have selected these hands you will be able to see the pre flop percentage of winning for all players. From here you can start to input the flop, turn and river if you wish to which again will affect the percentages of each outcome. 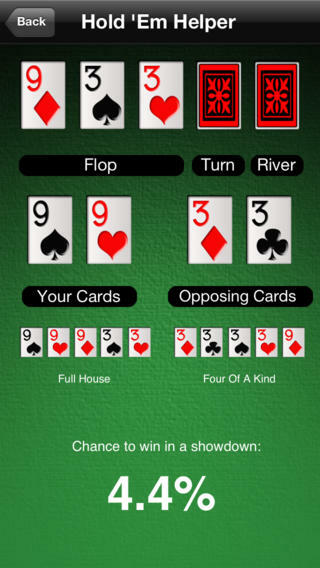 What’s really good about this app is the ability to flick between Holdem and Omaha. Very few apps for the price has both capabilities so this is definitely an app you should be trying if you play both variations of the game. Poker Sniper is arguably one of the best free poker odds calculator apps on the market; and here’s why. You can basically make the app as basic or as complicated as you like. First up you will be allowed to enter the hands of up to four players before the app will work out a percentage to win the hand for all players. The deal can be changed from the flop, turn or river for each calculation if you want more specific odds. On top of this it’s also possible to enter your opponents hand ranges which is arguably more important due to the likelihood that you don’t know the exact two hole cards your opponent is holding. By adding ranges of hands it allows you to get an even better base of results for your decisions and it’s here where you can input almost any combination you wish. 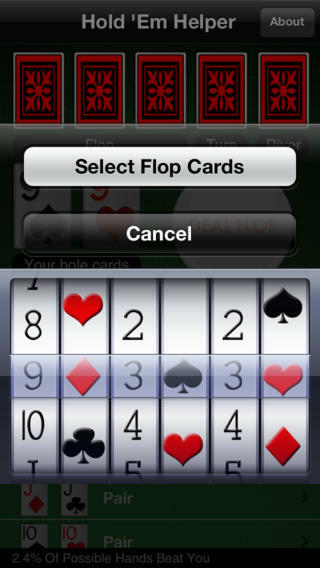 It’s also possible to allow the app to enter a random two card combination to see how your hole cards would fair. A very cool app, and for the price, arguably one of the best! Phil Hellmuth is one of the biggest names in the poker industry and his poker odds calculator has been designed to help players of all abilities understand the mathematics of poker more easily. The app starts a choice of choosing between their poker odds calculator and a couple of other – spammy – options of which bare no interest to us. 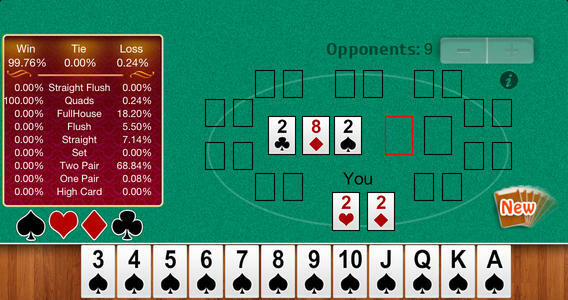 Once into the calculator you first need to select your hole cards before selecting that of your opponents. What’s nice about this app is that you can choose between a range of hands for your opponents without having to specify the exact hand they are holding which will prove a lot more beneficial when calculating odds. You can add and take players away whilst also see how each scenario is affected by each community card. One thing we would like to point out on this app is that the free version includes a lot of ads. Even more than most free apps. It feels as though its desperate to get you off the app and this makes it less than appealing on the eye. My Poker Evaluator is actually one of the latest poker odds apps to the iPhone and iPad market. It’s a pretty simple concoction and aimed at beginners of the game or people learning what sort of percentages each hand represents. The app employs a scrolling method to choose your card which isn’t always the easiest way to select them but does work reasonably well. You start by choosing the hands for player 1 then player 2 but unfortunately the app doesn’t allow more than two players per hand. The lower section also allows you to add cards to the flop, turn and river or if you wish, none at all and simply see the preflop percentages. At each stage you can click the evaluate button which offers you a look at the win, lose and tie percentages for each hand. Overall this is a pretty basic app and has its limitations, but for free, it’s not too bad of an effort. 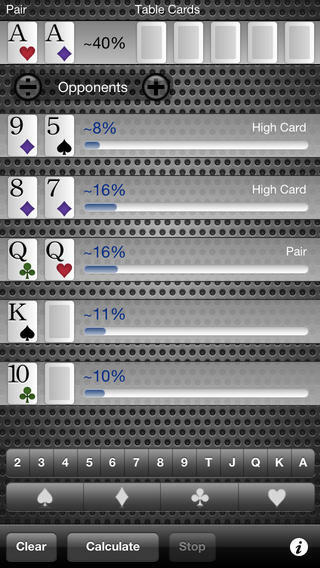 First up, a great feature on the Poker % app is a short 30 second or so video tutorial of how to use the app. It shows you everything you need to know to get started and on top of that there is an information section that gives you a little bit more detail as to what each section represents. The screen is well laid out and the first thing you need to do is choose how many people are at the table. Once this is done you can go through each position to input their hand if known. If not then you can leave this blank before entering your flop, turn and/or river. 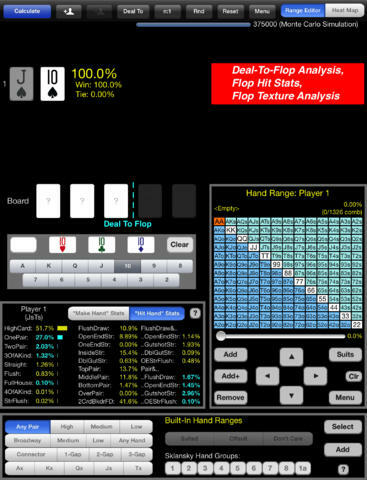 From here you can not only see what sort of chance you have of winning the hand but also what outs you have and then percentage of hitting each out. 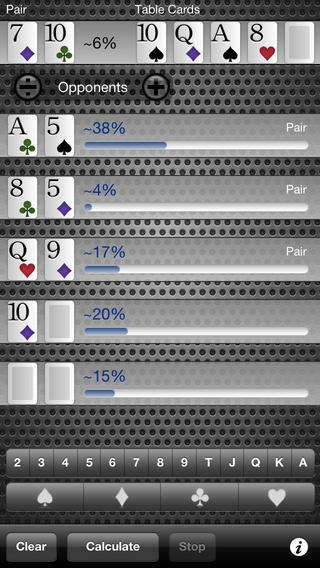 Unfortunately you can’t input opponent’s ranges, which leaves the app a little bit short, but on the whole it’s an excellent effort from the Poker % app. The iPhone and iPad have quickly become one of the most important products of the 21st century. The connectivity the phone gives its users via a number of forms is simply second to none and it was only a matter of time before online poker started making use of its diverse capabilities. Whilst playing online poker on your iOS device is still a pretty new concept for many online poker rooms, what is readily available are poker tools, none more so that odds calculators. These are becoming increasingly popular for the majority of poker players and like anything that is growing in popularity, more companies are starting to release their own versions. 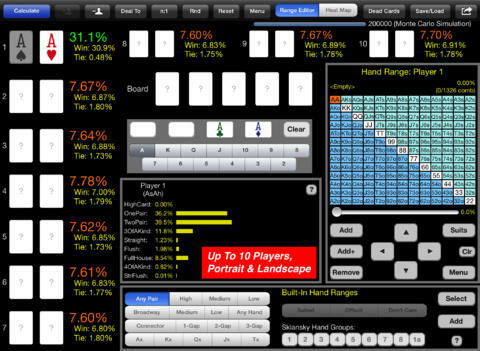 This article will be looking at some of the top iPad/iPhone poker calculator apps and how they compare against each other.